Remember when Metal Gear Solid 4 was launched? And how it was such a big deal that the game wasn't coming to the Xbox 360? Remember that? On his online radio show, Metal Gear creator Hideo Kojima talked about why there wasn't an Xbox 360 version of Metal Gear Solid: The Legacy Collection. "I'm sorry to say an Xbox 360 version isn't being released, because an Xbox 360 version of MGS4 hasn't gone on sale," Kojima said. "To explain the situation, the amount of data in MGS4 is just too enormous." The PS3, Kojima pointed out, uses Blu-ray. The Xbox 360 uses DVD. 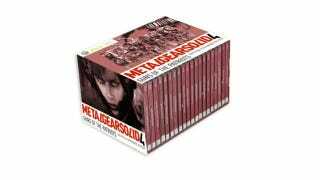 So if Konami were to put out MGS4 on the Xbox 360, one of Kojima's co-hosts added, it would take up seven DVDs. In the past, Kojima has mentioned similar high DVD disc counts for the game—thus, explaining the above meme image from year's past. "I want to put it [presumably, The Legacy Collection] out [on the Xbox 360]," Kojima continued. "But we won't be releasing it." "When it's the next [Xbox] console, maybe we can release it [again, presumably, The Legacy Collection]," added Kojima. "If we released a version on the Xbox 360 without MGS4, then it's not The Legacy Collection." Makes sense to me! That being said, I'd love to see a seven-disc version of Metal Gear Solid 4.